Want to go to New York? Join the club! New York City is one of the most popular travel destinations on the planet, which equals high prices and huge crowds. As a backpacker, though, there are still plenty of ways to save money in the City That Never Sleeps. Comprised of five boroughs (Manhattan, Staten Island, the Bronx, Queens, and Brooklyn), NYC's main area of interest to you will most likely be the island of Manhattan (which is where Times Square, the Empire State Building, Greenwich Village, Central Park, and all that fun stuff is), so much of this guide focuses on that. The first rule of travel is to pack light at all times. We recommend traveling with just a carry-on bag if at all possible, as it saves your back from pain and makes moving around easily. Plus, it helps you avoid airline baggage fees! You don't need to bring much to New York because if you forget anything essential, you'll be able to buy it there. The most important item to pack is a pair of comfortable walking shoes because even if you plan to take the subway from place to place, you'll end up walking far more than you think. It could not be any easier to travel to New York: no matter where you start from, you can end up there, whether it's by plane, train or bus. Two major airports serve New York (JFK and LaGuardia); three if you count the Newark airport. Try a student airfare agency like STA to save a ton of money on student fares, but don't be fooled by some airlines' "student airfares", which are usually just as pricey as regular tickets. STA is the way to go for student airfare. Airfare sales do happen, though, student or not. Check Skyscanner for deals before you book anything. Once you land in the Big Apple, you can take the Air Train from Newark (under $12) or JFK (under $8) to and from Penn Station in central New York. You could also share a cab from JFK into the city for a flat rate for the car (About $50 plus tolls) or take the city bus (under $5) to and from LaGuardia. If you can find an Amtrak route that works for you, taking the train to New York City is a lot of fun. Amtrak runs straight into Penn Station at 7th/8th Avenues and 34th Street in central Manhattan, from where you can jump on a bus to anywhere in the city. And you can even take the train to Penn Station all the way across the U.S. from San Francisco if you fancied a real adventure on your trip. If you're a U.S. student, you can grab an ISIC discount to save big on train fares. There are plenty of options for cheap buses in the U.S., and on the East Coast, there are far more options than just Greyhound. And if you already know that Greyhound can be cheaper than driving (especially with Greyhound's student discounts), know that Megabus and the lines known as "Chinatown buses" are often even cheaper. Hostels are the way to go when backpacking in New York, as they help you save money and introduce you to people from around the world. They're a lot of fun, too. Chelsea Hostel in central Manhattan (the Chelsea neighborhood) is great for its proximity to Penn Station and relatively quiet, and Jazz on the Park in Harlem is recommended for its hipster atmosphere. If you've never stayed in a hostel before, we highly recommend it. Where to begin? There's so much to do in New York that you could conceivably not sleep (and this is, after all, The City That Never Sleeps) for a month and still have thousands of things left to do. One of the best ways to get to know a new city is via a walking tour. New York City is fantastic for window shopping, too. Head for Canal, Center, Elizabeth, Grand, Mott and Mulberry streets in Chinatown to cruise the scents of fish and spice markets, and check out the Orchard Street Shopping District (Houston to Canal along Orchard and Ludlow), Soho, the Village, and more. Shopping here is not about Park Avenue and upscale Columbus Circle (where a backpacking pal once got escorted out from a security guard for looking too scruffy) or even the South Street Seaport (Gap, Abercombie, etc), it's about the unique stuff. Head for Chinatown, Soho, Nolita (North of Little Italy), the St. Marks Place street market (8th Street between Avenue A and 3rd Ave), and cruise by Cobblestones at least once for vintage clothes. And then there's eating. Ah, yes. Like any major metropolis, New York is one of the best cities in the world to eat, and if you're on a backpacking budget, there's still plenty of options for fantastic food. And we can't forget the clubs. Like the rest of the United States, the drinking age is 21, but there's nightlife to be had for all ages (and at all hours) in New York. 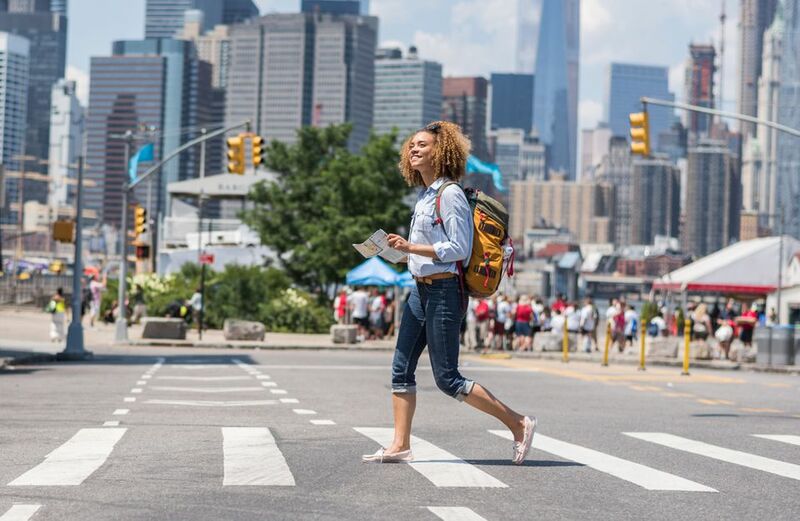 Get ready to walk, walk, and walk some more: Manhattan's blocks are always longer than they look on a map. That said, getting to the neighborhood you seek is never difficult, as subways and buses crisscross the city all day and night.